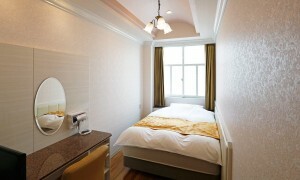 Hotel Fine Garden Juso is located in Osaka, a 5-minute walk from Juso Train Station. Hotel Fine Garden Juso features stylish rooms with a flat-screen TV and karaoke facilities. Free parking is provided and free Wi-Fi is available at the entire hotel. Elegant rooms come with high ceilings and warm lighting. A bathtub, bidet and toiletries are in the en suite bathroom. Hotel Fine Garden Juso is a 4-minute train ride from JR Osaka Station, and a 40-minute train ride from Kyoto area. Kobe and Takarazuka Stations can be reached within a 30-minute train ride. The core of the area is Jūsō Station, the hub station of the Hankyu Railway system. The area typifies the unique culture of Osaka. Situated across the Yodo River from central Osaka, Juso is centrally located for easy access by Hankyu Railway lines to other major Kansai cities: 24 minutes to Kobe (Sannomiya Station) to the west and 40 minutes to Kyoto (Kawaramachi Station) to the northeast. Juso is also famous for its wide variety of high quality classic Osaka cuisine featuring okonomiyaki, negiyaki, and takoyaki shops. In August every year, a massive fireworks celebration takes place beside the Yodo River; the people who attend this celebration often wear traditional yukatas and wooden sandals. For travelers who want to take in the sights and sounds of Osaka, Hotel Fine Garden Juso is the perfect choice. Set 2 Km from the excitement of the city, Hotel Fine Garden Juso commands an excellent location and provides access to the city’s biggest attractions. From Hankyu Juso Station, it is 5 minutes walking. From Itami Airport (ITM), it takes 30 minutes by train.